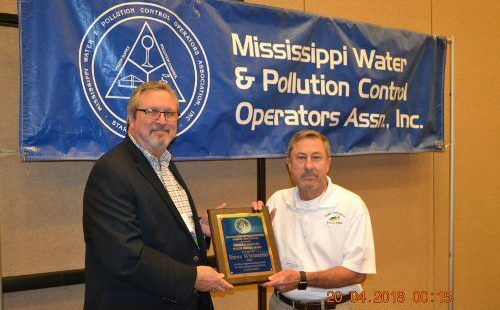 Steve Wittmann of Pass Christian was honored by the Mississippi Water and Pollution Control Operator’s Association on April 19 with the Howard K. Williford Special Service Award. The Howard K. Williford Award is the Association’s most prestigious honor and is given each year to a member who displays “outstanding dedication to the Association.” Tim Rogers presented the award to Steve Wittmann at the Association’s 48th Annual Conference in Biloxi, MS. The award is in honor of Professor Howard K. Williford who was instrumental in professionalizing the water and wastewater industry. Mr. Wittmann has owned and operated Coast Chlorinator & Pump Co. for more than 30 years, and also serves as the water operator for multiple coastal water systems. He is known by many in the water and wastewater industry for his knowledge, friendliness, and willingness to listen and offer advice. He has been involved with the Mississippi Water and Pollution Control Operators’ Association for 22 years. He teaches many classes for the association, offers exhibit hall training during conferences, and has sponsored many luncheons and other events. Photo Attached: (L to R) Committee Chair Tim Rogers presents the 2018 Howard K. Williford Award to Steve Wittmann of Pass Christian.